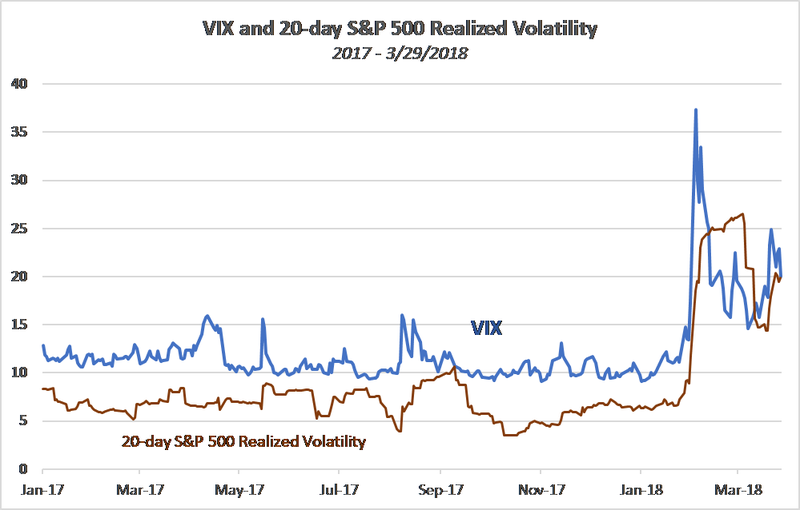 In February and March of 2018, volatility for the S&P 500 was 24%, over three times the level of 2017. This is in sharp contrast to 2017, which was the end of an almost two-year stretch of quiet markets, when the S&P 500 returned 22% against 7% risk (standard deviation). (see more details here). In the first three months of this year, we have seen 23 days (about one-third of the trading days) when the S&P 500 moved more than 1% up or down, compared to only eight days in all of 2017. Expectations of risk have moved higher as well. In 2017, the VIX averaged 11% and it has been hovering around 15% or higher since early February, also quite a contrast with last year, as shown in the chart below. In the last five years, investors were attracted to investment strategies that benefitted from low interest rates and a stable risk environment, such as low volatility and high dividend yield strategies, risk targeting, and selling volatility via VIX futures ETFs. We are in a new regime now—normal to high equity index volatility and more restrained central bank monetary policy across the globe. There is also concern about the extent to which we can depend on international diversification to help with fixed income or equity risk reduction as we have in prior years. As the cookie jar of monetary stimulus is being taken away, investors find themselves in uncharted territory. The recent sharp swings up and down in indexes have been driven in part by the flows as portfolio strategies shift into this transition phase. The speed with which investors are adapting to the new regime depends in part on their investment horizon and risk profile. Those with leverage or margin need to adapt quickly, as we have seen from the speed with which large technology stocks have sold off in the last few weeks in response to anticipation of more intense regulation. Some macro or top-down investors are also seeing opportunities to take more bearish tactical views after a long period of staying on the sidelines in the quiet and bottom-up markets. Investors with intermediate and long-term horizons typically take more time to adjust to a secular change in interest rates and a higher volatility environment. Over the next few months, we are likely to see a continuing impact from flows related to the repositioning of portfolios to reduce exposure to interest rate risk and to adapt to the higher volatility regime. Global equity indexes will likely be buffeted by divergent views on the speed of interest rate increases, the risk of inflationary pressures, and their impact on company fundamentals. On top of this, we have a key election in the U.S. this fall, whose outcome adds political uncertainty to the economic picture. How best to navigate these uncharted waters in equity and bond markets? First and foremost, there is some housecleaning to be done to reduce exposure to interest rate risk in both fixed income and equity portfolios. This means reducing duration in fixed income holdings and in equities trimming exposure to interest-rate-sensitive equity sectors and strategies which focus on high dividend yield equities. Other approaches to boosting income, such as covered call option and collateralized put option writing, deserve a closer look, as they can be applied to more broad-based and diversified underlying stock portfolios. In higher equity volatility regimes, short-term option selling strategies benefit from a higher premium priced into options, and their frequent rolling limits losses on volatility surges. Investors can reduce overall portfolio risk without a shift to fixed income by using downside protection strategies that use equity index put options. These strategies seek to reduce risk exposure during turbulent markets and can cushion the losses of holding equites. Long put or put spread option exposure appreciates as index levels decline and volatility expectations expand, helping to generate gains when other parts of an equity portfolio are sustaining losses. Unlike the risk-reduction strategy of shifting stocks into cash or fixed income, hedged equity strategies can be structured to allow the investors to participate in some of the upside of equity performance, net of the cost of the hedge. Bottom line, in this new regime, with interest rates rising and equity volatility returning, options strategies allow investors to maintain their overall portfolio exposure while at the same time boosting income and mitigating risk.